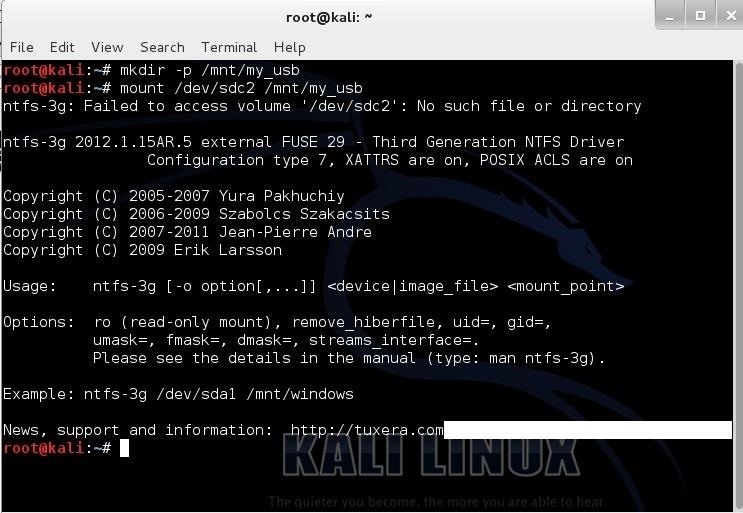 Hi there, nullbytes :) I've recently seen many questions regarding VMs with Kali, and personally I prefer using a Live Boot USB to get Kali without removing my system (and for many reasons). · You take no space of your Hard Drive for it. 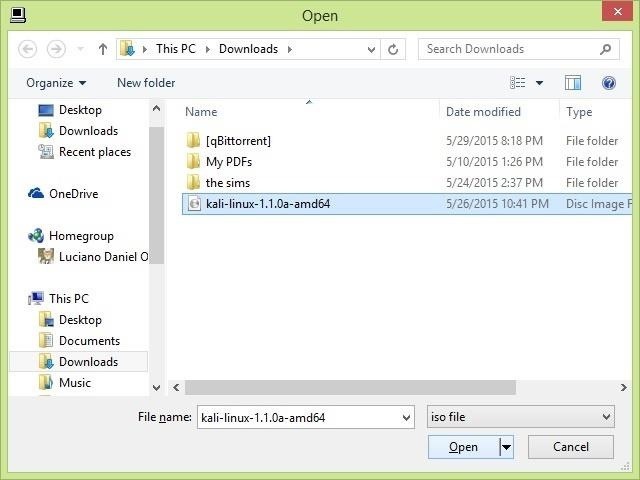 · You can take your OS to any PC you use. And you just need a USB flash drive of at least 4 GB with nothing on it to get it, so why not give it a try? For this tutorial, I'll assume you're starting from a PC with Windows installed, as most newbies do. 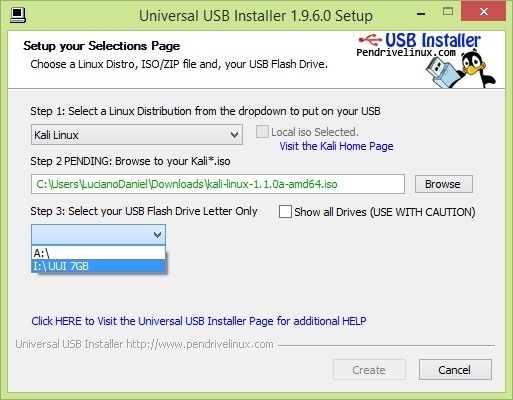 First, you'll need a program to install Kali on your USB drive and make it bootable. 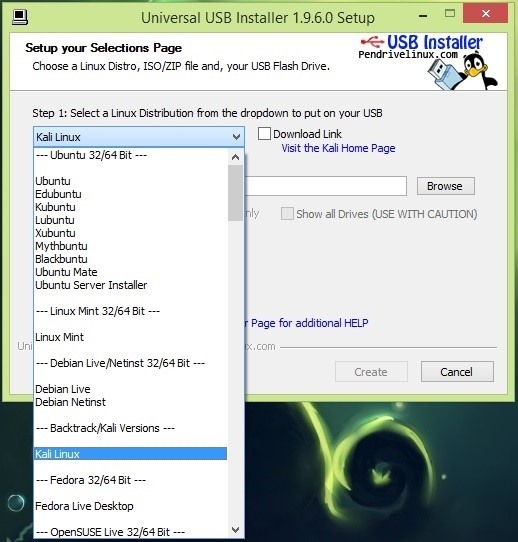 My program of choice is Universal USB Installer, as it's painfully easy to use and it has a direct link to many Linux distros download page within the program. If you haven't downloaded a Kali image yet, just check the "Download Link" box and you'll be taken right into the download page. If your system is 64 bit, you may want the 64 bit ISO, but it doesn't ensure you portability to all the PC's you find. If you're not sure whether your PC is 32 or 64 bit, choose the 32 bit ISO. It'll work for both architectures. You can choose Direct download, but if you have a pretty slow and unreliable connection, download it via Torrent. If you never downloaded something via Torrent, you could look it up. It's pretty damn simple. And then choose the drive letter for your USB drive (you probably won't need to use that checkbox on the right side). Be careful when doing this. I'd recommend to check the box that formats your USB drive. That'll wipe your whole USB drive, make sure you back up everything you had there before proceeding. It'll make a quick format, so there's no reason to avoid this. Click on Create, then Yes, and it'll do the whole process by itself. The longest part will be extracting the ISO to your USB, but it'll be over in a matter of minutes. If everything went as expected, you'll see this, and you have a USB you can Live boot you Kali from. You may have to do a little tweaking on your BIOS for it to work, but I don't know how to cover every BIOS on a single tutorial. 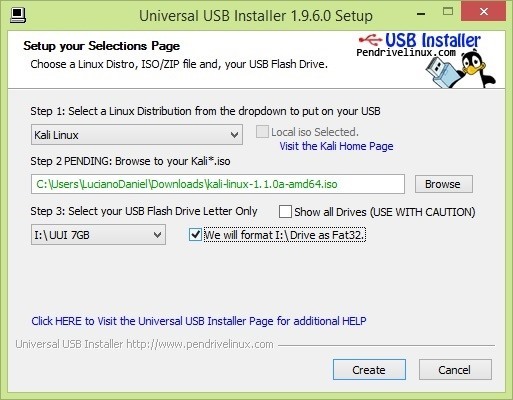 If you're already a Linux user, follow these steps to make a Kali Live USB. It's way simpler and faster than Windows! · Make sure you have a 4 GB+ USB drive connected and you're ready to get it cleaned. · Download the Kali ISO of your choice (32/64 bit). Wait for it to finish, and that's it, you have Kali on your USB drive now. You liked to Live boot from USB, but you want to save changes made into your OS, or just files (such as .pcap files) into your USB drive? You'll need to set up Persistence. Your USB drive must have 8 GB+ of storage space. 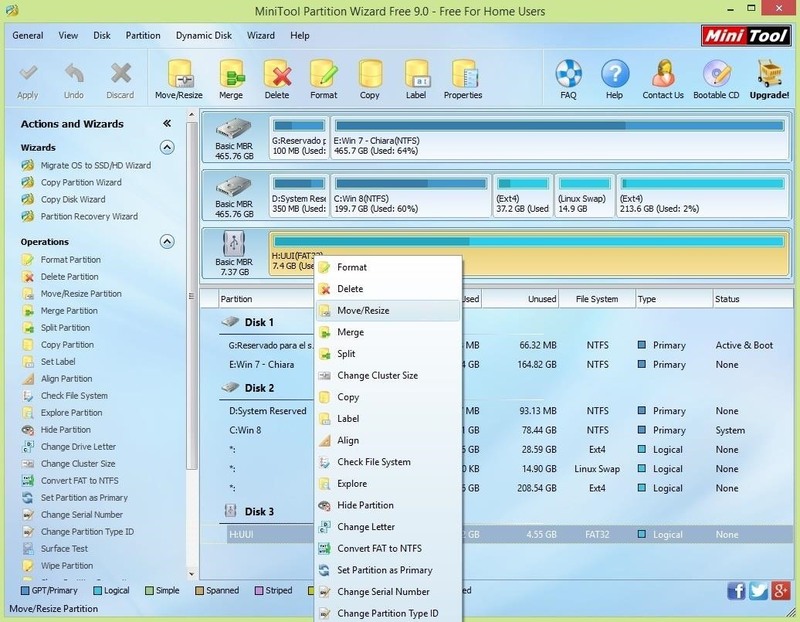 Download MiniTool Partition Wizard Free, install it, run it and then choose Launch Application. 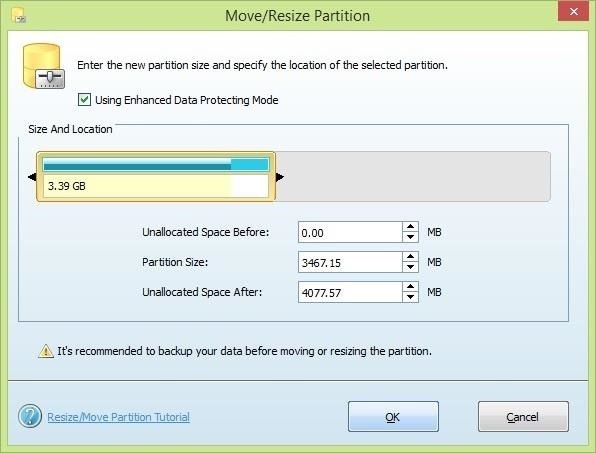 Use the small black arrow keys to shrink the partition size. 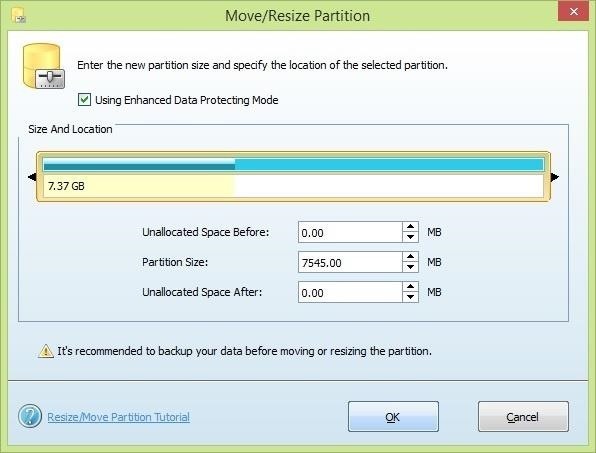 It will leave a bit of storage space free, but if you manually assign the Partition Size, the program may fail. Click OK.
Now click on Apply (upper left corner), and just wait for it to complete the tasks. Remember your drive had a FAT32 partition and a Ext4 (Linux) one? I hope this article is useful for newbies who are getting their heads messed up with VMs instead of just booting up Kali and getting their heads messed up by using Kali. P.S. : Sorry Mac users, I don't know about your system. Yet. P.S.2. : I'll do a Linux partition guide when I figure out how much space I can crop without screwing up my drive, but you can have fun with GParted in the meantime. Fantastic read! Thorough analysis, great detail! Thank you! Awesome post KITTEN. I think you gave the exact amount of detail necessary. Can't wait to read your partition guide - I've been planning on triple boot my systems for a while but lacked the exact know how. Oh, maybe that description at the beginning was misleading, I just mentioned my setup as a comment. 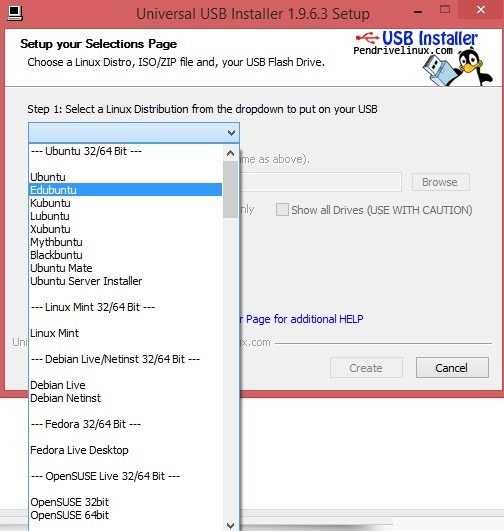 When I talk about the Linux partition guide, I just meant I wanted to show how to partition the USB drive properly starting from Linux, just as I showed a Quick Linux guide for installing Kali on a USB stick. Would you want a tutorial on how to install Kali on your machine and make it dual-boot (or triple, quad, etc)? That's entirely a different story, I didn't write about it because you risk of losing everything on your HDD if anything goes wrong. If anything goes wrong installing Kali on a USB, you backed up what it had previously, and no harm is done, it can be formatted again. It would be cool to have a tutorial on triple boot I guess, but I understand know what you meant :). hey when i create the partition on the usb, my computer is not able to read my usb. When i take away the partition you talked about above, my computer is able to read my usb, but then without the partition, i cant save anything. 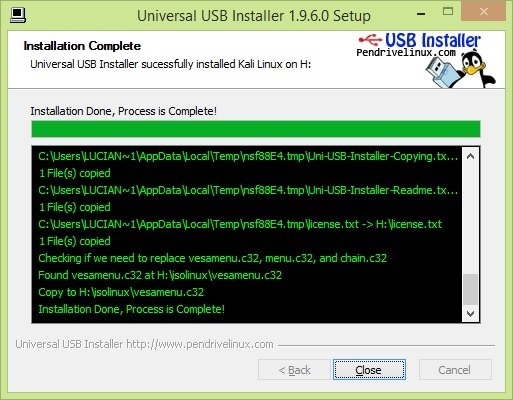 To wrap it up, make partition, computer cant read my usb, when i take away the partition, my computer is able to read my usb but i cant save anything in kali linux. I am just wondering why not to boot your system with Kali Live CD and install it in USB instead of HDD? I am just wondering why not. Could there be some issues if I start moving my USB through different PCs? I am not sure how kernel would deal with that in the long term solution. I have this setup in so far I have been using it without any issues. Well, that0s what Persistence is all about!! 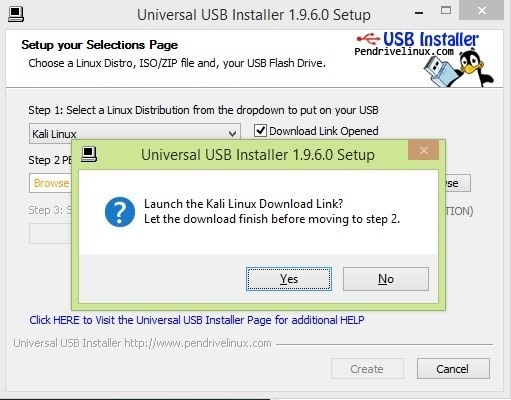 What this tutorial is about is installing the "Kali Live CD" on a USB, not the OS. If you installed the OS, then your PC depends on your USB drive to boot up. That's pretty unreliable, I wouldn't reccomend it. I'm from Pakistan I want to install Kali Linux but the location is showing in the list. Plz guide me. I will wait for your suggestion. Great tutorial! I don't think that there is a tutorial on Null-byte on setting up Kali Live. I also like it that you are including a section on setting up persistency, so that you can return to your OS the same it was before! Well, there is this post, that made me fear mine would get deleted for repeating information, but I felit like it was too general and not newbie-friendly enough with this subject. 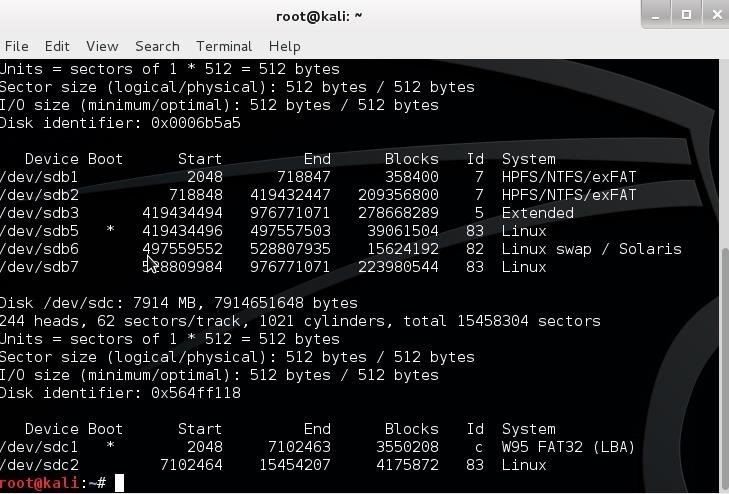 Ciuffy delves into many ways of using Kali (CD, USB, VM, Dual-boot) and configuring MBR for BIOS and EFI. He even wrote a FAQ! I know there are reasons to install a proprietary driver for Kali, but don't go crazy on that, there' still loads of things you can do if you can't install them. Or Google your problem, I found this article from BlackOps that seems to cover what you want to do pretty well. Excellent guide! As someone who always uses a VM. I will definitely be trying this soon. Thanks for posting. Thanks! Unless you use VM because you have a hacking lab set up in it, this is way better in every way. Yeah, I was wondering about that. All my USB drives (excepting my external HDD) are 2.0, and neither my desktop nor my laptop have USB 3.0 ports. by this is Kali functions work correctly once i did that to Ubuntu but many actions were disabled, what about Kali then? can i save all the settings ,updates etc on it? Thanks for your post. But is there any way for MAC? Probably, but as I don't own one, I don't know it it's possible. oh ,i didn't see it.sorry. Yours might be sdb2, or sdb1. 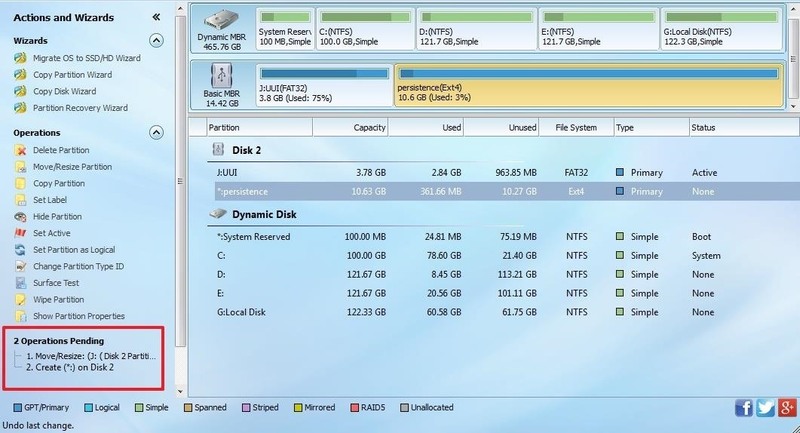 I used sdc 1 because I have two HDD in my computer. Check what's your thumbdrive letter with fdisk -l. It will have a Linux partition and a W95 FAT one. The one you want to make persistent is the Linux one. You must have mounted the drive. Hello. Can someone please help! I have downloaded the correct 64bit ISO for kali Linux, I then used a 4GB USB and wrote the program to it using Win32 Disc imager. I booted from the advanced settings and I keep getting a message that says USB not authenticated. I have Windows 8 and I have a HP laptop. What is the problem. So far I have tried numerous times with no success. I'm not sure what the problem is. There must be something in your BIOS that's stopping it from booting. Maybe something called secure boot? Thank you. Do you know how I would change that setting? I actually found success. Thank you Kitten. Now all I have to do is learn how to use the new OS. I finished the last step and my computer restarted. When it booted the linux menu appears. Is it should be like that and every time I should choose usb persistence? or did I do somting wrong? You must choose USB Persistence every time, unless you want a live session that doesn't leave anything after it halts. Great i managed to save files into "pesistence" the unlabeled partition we mad..
Ddi you do the part of "Configuring the partition"? You forgot to put a space in the mount command. You also wrote /union instead of / union after that. I can't see it clearly, it'll probably be possible, but a different method may be needed. well, I hope as they release 2.0, they make update their Kali Linux docs . After i add a kali linux with persistence in a usb device i can add more OS like tails and windows in same usb device? I did everything as per the steps given...did the procedure for persistence too...but when i tried to boot kali from the usb, it just shows a message "Boot error" just below the "Verifying DMI pool data.." message. 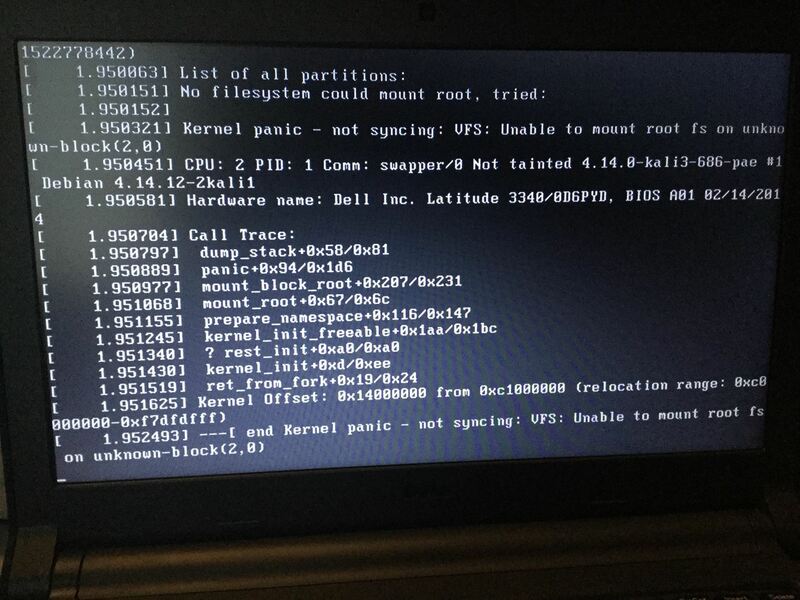 Kali boot screen didnt even show up. Did i do something wrong? Or is it my PC? In case anyone is wondering. This process works on Kali 2.0. For whatever reason, it only works when the original ext4 part is 8gb or less. But if you have a larger partition available, just make the 8gb first and after you test persistence and ensure that it is working. 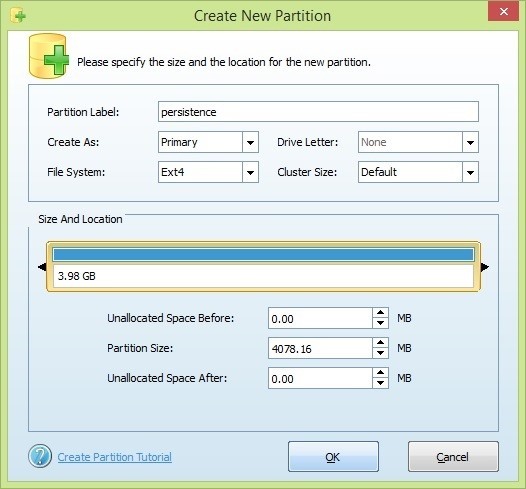 Open gparted and extend the persistence partition to whatever size you want. Just in case this helps. Live long and prosper. Your instructions were not over detailed. I greatly appreciate that you wrote this. I didn't read ahead however... I didn't see the part where you said not to click on the persistence folder on the desktop til it was too late. What does clicking on that folder do? When I try the mount command I receive the error that the path can't be found in /etc/fstab. Any help here greatly appreciated. And that's all. Nothing happens. Later when I click esc or backspace it goes between two images similiar to this and that's the end. Can't open a Terminal, can't do anything. "error: no such device: d75a65fc-e4f5-4b25-9cb4-a82efc6bbb8f. Then i turned off my pc and turned it on with USB in it. So it took me to GNU GRUB there i could chose between Linux Kali and Windows 8 (loader) (na/dev/sda1). So now i cant go in any OS without USB in my PC. I have a question. I was wondering, if I can create the persistence derive in my HDD. 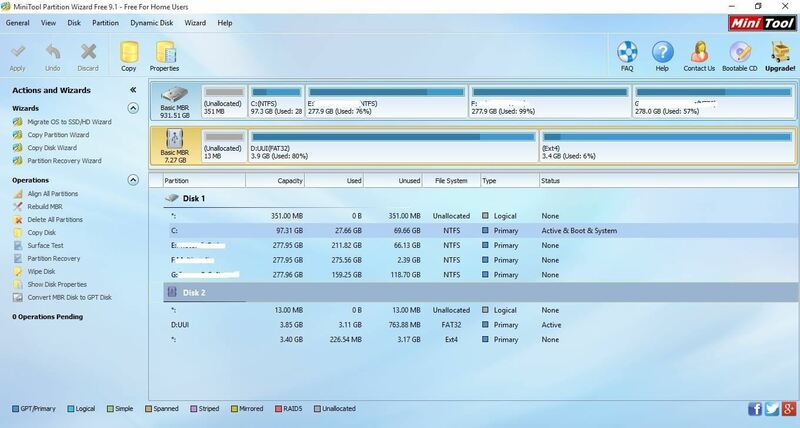 Is is possible to have persistence space in HDD and use it while Live booting from a USB. Actually I am not being able to setup Kali 2 in my HDD, because of CDROM not found issue. So I was wondering if this method can be applied. I had the same CDROM issue, when you get to the retry part, unplug the USB. Then plug it back in and wait for a few seconds before pressing retry, Done! Went to the UUI website downloaded the wrong file and BOOM! 1-855-402-4168 Popup! They really are a pain in the a$$. And right before I have to got to work. Good thing there is nothing on that computer, (I may be a nooooob but I know that much). Live and learn. Failed to mount '/dev/sdb2': Invalid argument. The device '/dec/sdb2' doesn't seem to have a valid NTFS. So after my first little mishap... I followed the first part of the post and got Kali live on my USB! Tweaked my BIOS to load it. 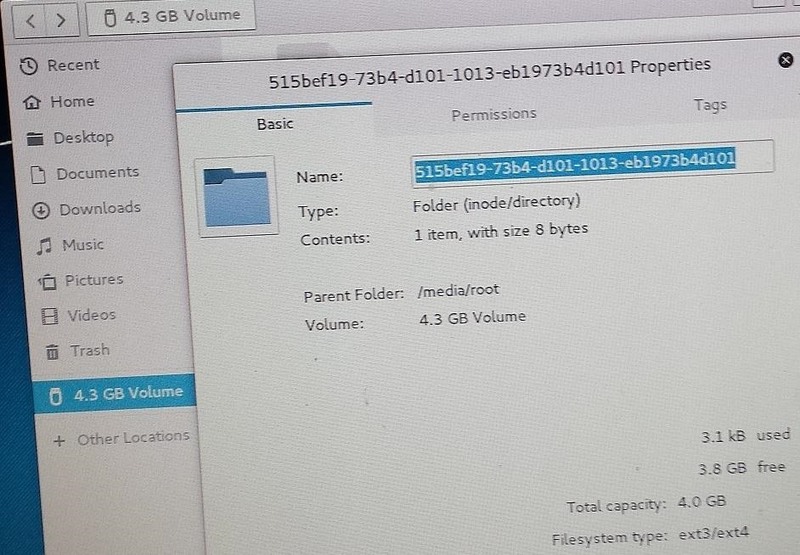 After I played around in Kali and doing a little more home work, I tackled the USB partition. No problems at all. Thanks Kitten for this awesomely written post. BUT... I have a problem. IDK what I want to do in Kali first! Firstly learn commands to use in terminal; start with the linux basics guide on this very webiste. Then move on to metasploit. Hey i was wondering if the process becomes easier if you do the step 4 in UUI, "Set a persistent file size for storing changes" option.I am using v. 1.9.6.3 of UUi so the option must have been added later on.does that save you the hassle of using MiniTool Partition Wizard? EDIT : My bad,that option was showing just for Ubuntu. I have done exactly as mentioned above but it is not working .Can any one say mewhat the problem is ? Are any networks showing up, or are they showing but you can't connect to them? Whenever I create a live usb with the universal USB installer, they don't work. I can make a working live usb with win32 disk imager, however it removes the device name so it's just called D: so what would I call the disk while using the command line to create persistence? I get to the point where I create the unallocated space on my USB stick, and I right click that space and hit 'Create' but I get an error: "MiniTool Partition Wizard cannot create a new partition on this removable disk. If you like to create several partitions on this removable disk, you need to delete all the partitions first." help anyone? I have burned the iso in uui and managed the partitions appropriately in partition manager in windows, but when I reboot and press f9 (hp laptop) to go to the list of bootable drives, usb ain't there. I have tried turning on legacy support, I have tried turning off secure boot, I have tried moving usb up in the boot priority list, I have pressed shift+restart in windows and selected "boot usb" option (it just says it fails when I try that), and I have no idea what to do. When I turned on legacy, usb does show u as option, but if i select it, hp says "selected boot drive failed to authenticate." I tried this all on a 2.0 64 GB usb and now I have a 3.0 64GB usb, both have been formatted before I started the project with every format out there. Can someone please help? Thank you so much for these well presented, detailed instructions! Unfortunately, I have a problem - even though I followed everthing to the letter, and received ZERO errors (except when I omitted a space in the same place someone else that posted earlier did) - everything works perfectly except - no persistence. It would be much easier to help me if I could offer some sort of error message etc.. but I have none. I positioned the cursor after the text to make sure there was no white space after the text. Everything seems exactly as it should be yet - no persistence. No saving the configurations made to the web browser, no saving the CA certificate in the browser from Burpsuite. I am clueless as to trouble shoot this. Any help would be greatly appreciated! I wanted to add some screen shots that may be helpful - does anything look amiss here? Hello there. 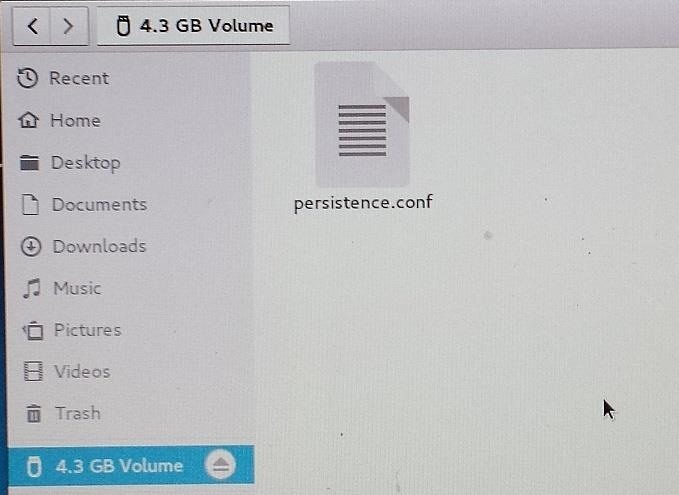 I've managed to successfully save downloaded files to the "persistence" folder that was created to the desktop, -it's the only folder that can save anything permanently- but I still have an issue with the system changes. Specifically, when I change the background or the security settings and that sort of things, they are all gone after the reboot. Any ideas? I owe you a BIG Thank You for the tutorial!! You'll need to use lsblk to determine what device your USB stick is. I made exactly as in the guide but i have a huge problem! After i boot up Kali live usb with persistence everything seems fine except for one thing... my root folder shows only 2GB of free space as available... i use gparted and there i see 10gb for primary and the rest for persistance... when i used the command "sudo apt-get upgrade" it failed in the end for not having enough disk space... now after that command i have like 27 MB left on root folder... or "Computer" in the "other" section... what should I do to rezolve that? Thanks and sorry for the inconveniences! Great tutorial! Last night, when I was really tired, I tried it, and accidentally formatted the drives on my OS X laptop to EXT4, which not only erased my data, but OS X can't read any kind of EXT data, so I had to reinstall OS X. Oh well! Thanks for the tutorial! Hello! When I do this, it just creates an apparent drive that follows my system through reboots. The stuff that I insert into there is saved completely, between systems and reboots, but everywhere else like the settings and the desktop (and more importantly installed tools like shellter) are simply thrown. I followed these instructions to the point where I copypasted commands. The only difference was that I made a 24gb partition (28gb drive) instead of a 4gb partition. Help? I did this last night but there was something wrong with the nullbyte servers so I couldn't comment. LOL. 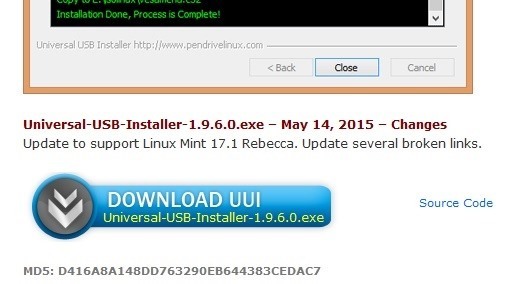 Is it possible to update a persistence live USB? Like apt-get update, apt-get upgrade and apt-get dist-upgrade? I am not sure if it will boot kali linux. Have I done anything wrong? Thank you Kitten, Nice tutorial. I follow all step in this tutorial. But I still can't save a file in root folder. I mean, I try to save a text file in /root, but After rebooting my text file is not there. Then I try to save a text file again to /union folder and rebooting, And my text file in there in /union folder and saved successfully. 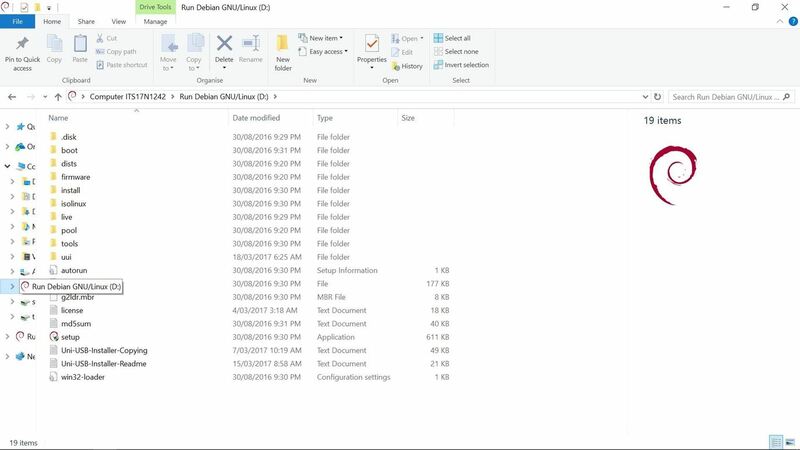 Is this true that I can't save in /root folder, but i can save in /union folder ?? If that true, is it means i must update my Kali everytime after reboot ?? Are you sure the persistence icon disappears after reboot? If not, you have to start it again. Please what do I do.. I am certain to have followed all the procedures accordingly. Please tell me if the usb will still be usable like a normal usb. I have a 16gb usb drive so I am thinking of using 6 GB for kali linux and rest for myself. Will it work out? i did everything according to how you wrote above but i am unable to save my files. for example i try to save text file on my desktop but when i reboot, the file is gone. i need help please help me. Hi, question from a beginner: are there any additional risk live booting from USB compared to a VM if I mess up with Kali? For example malware spreading from Kali to my Windows host? Thanks in advance for your answers! so i've tried to do this about a dozen times, both encrypted and non-encrypted, and once i reboot the persistence is no longer locateable and none of the files i've saved as test docs are saved on the desktop. I tried remounting the drive but nothing works. sure that minitool partition wizard worked for partitionioning usb pretty quick but it also installed malware on the system ! all kinds of problems, lag, blank screen, etc afterwards; new chromium browser installed as default without permission, after advertised "anti-virus" was declined. new processes like CACE remote packet capture running when they never did before. Hey, you should untick the unwanted programs that come with the installer. How do you want to become a whitehat if you fall for such cheap tricks? Or, also, you could install Unchecky on your computer, to evade most "unwanted ticks" on installers. I have it, but I check on every installer anyways. Will this work with Parrot OS? Thanks for the wonderful write-up and clear picture directions. I followed the article and got it working on a 32 bit windows 10. But when I tried to boot the same USB on a 64 bit windows 10, it got stuck on the black page, just reeling up some numbered error message ending with "ffffffffff"
In this article, you said that 32 bit ISO file should also work on 64 bit computers. hi! I got this working, but I dont know if I have a problem or if it is a limitation. I can save files to the persistence drive, but any settings I make are not saved. when I mount, I dont see any icons on the desktop, but ive read that this version wont show icons.